Thank you to Holly for creating such a simple and beautiful piece of art with our baby boy's name. Oh, how I LOVE to see his name. What a really nice surprise. Thank you, Holly! This picture reminds me of Evan and Kyle jumping and playing in the leaves this past weekend. I think this is Nicholas' way of joining his brothers. That was so sweet of Holly to do this!! So beautiful. I got one in my inbox as well for the boys! It melted my heart. Such a wonderful idea for a picture. Holly is amazing. And, boy does she have nice handwriting. I can't wait to post Ella's. As always, your boys are too cute. Wish we had fall leaves in California. That is so very beautiful and special. 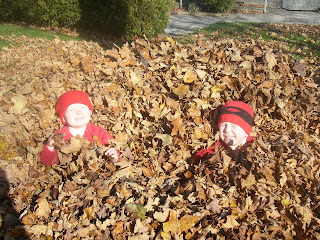 The boys look so cute playing in the leaves. I love Nicholas' name in leaves! What a nice idea. I love that! So sweet. It is beautiful. I love what Holly is doing, she is so sweet.